1. Institute of Animal Science, Chinese Academy of Agricultural Sciences, Beijing 100193, China. 2. Department of Bioscience, Department of laboratory medicine, Bengbu Medical College, Bengbu 233000, China. 3. Key Lab for Animal Biotechnology of Agriculture Ministry of China, Northwest A & F University, Yangling, 712100, China. Reversine, a purine analog, had been evidenced that it could induce dedifferentiation of differentiated cells into multipotent progenitor cells. Here, we showed that reversine could increase the plasticity of long-term cryopreserved bovine fibroblasts, and reversine-treated cells achieved the ability to differentiate into all three germ layers cells, such as osteoblasts and adipocytes from mesoblast, neurocyte from ectoderm, hepatocytes and smooth muscle cells from endoderm. Moreover, treatment of reversine caused the grow arrest of fibroblasts at G2/M and distinct cell swelling resulting in the formation of polyploid cells. In parallel, reversine treatment induced a multipotency of fibroblasts might be attributed to the activation of histone modifications, especially the degression of DNA methylation. However, molecular and cellular experiments suggested that reversine treatment enhanced selectively the expression of pluripotent marker gene Oct4 and mesenchymal marker genes CD29, CD44 and CD73, but Sox2 and Nanog were not detected. Taken together, these results clearly demonstrate the ability of reversine to dedifferentiation of long-term cryopreserved somatic cells through activation of pluripotent gene Oct4. Keywords: Reversine, Fibroblasts, Multipotency, Dedifferentiation, Oct4. The reprogramming of somatic cells into induced pluripotent stem cells (iPSCs) opens up a new approach of treating fibroblasts, which accompanies the global reversion of the somatic epigenome into an ES-like state . Dedifferentiation of somatic cells to multipotent progenitor cells also gives great potency to treat incurable or degenerative diseases by patient-specific stem cell therapy [2, 3]. However, the slow reprogramming process, the low reprogramming efficiency, the reprogramming inconsistency and the potential safety hazard impede the clinical application of iPSCs. The epigenome of somatic cells may be reprogrammed using small molecules that could temporally control the expression of specific factors involved in dedifferentiation signaling pathways regulating pluripotency without abnormal genetic modification . The identification of small chemical molecules that improve the plasticity of somatic cells would provide broad application to use healthy and abundant somatic cells to generate different types of stem/progenitor cells for therapeutic applications . Moreover, there are considerable advantages in use of drugs to promote the dedifferentiation of lineage-committed fibroblasts. Researchers have searched for chemicals that could induce differentiated cells into stem cells through high throughput screening of 50, 000 small molecules and identified one of them, a synthetic purine analog, called “reversine”. Reversine has been shown to increase the plasticity of lineage-committed murine myoblasts and dedifferentiate into mesenchymal progenitors that can redifferentiate into osteoblasts and adipocytes, respectively . In addition, it was demonstrated that reversine reprogrammed human and murine fibroblasts into myogenic-competent cells, which could be induced to differentiate into skeletal muscle, smooth muscle and bone . Thus, it is of great interest to elucidate a possible molecular mechanism for the reversine stimulated cellular dedifferentiation process. The expression of Oct4, a transcription factor of the Pit-Oct-Unc family, starts from the 2-cell stage and appears to be a key pluripotent marker for evaluating the reprogramming level of cells or embryos [8, 9]. Oct4 plays essential roles in the establishment and maintenance of pluripotency with other important pluripotent factors, namely Sox2 and Nanog. Aurora B, a chromosomal passenger protein, is involved in multiple mitotic functions, and therefore inhibiting its kinase activity causes varieties of phenotype including chromosome segregation barrier, spindle checkpoint impairment, and inducing the phosphorylation of histone H3 . 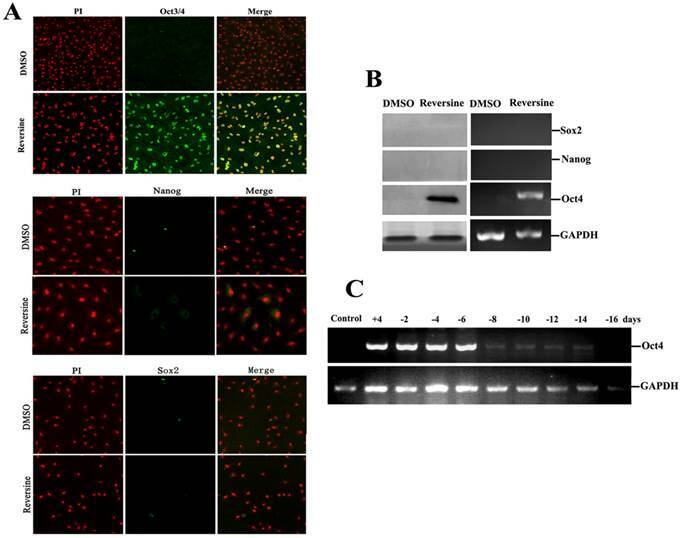 In this study, we further investigated the biological activities of reversine to stimulate the dedifferentiation of bovine fibroblasts and its molecular mechanism of action associated with dedifferentiation. Collectively, we present an effective, safe and direct dedifferentiation method that fits for long-term preserved fibroblasts. The fibroblasts from ear marginal tissue of Luxi cattle were cultured using tissue adherent culturing method and enzyme digestion, and cryopreserved for more than 8 years in liquid nitrogen. Luxi cattle is listed in the 138 state-level protected domestic animal breeds and is one of the four most important cattle breeds in China. To recover the cells, the frozen tubes were removed from liquid nitrogen and quickly thawed in a 42 ℃ water bath, and then the cells were transferred into culture dishes with DMEM containing 10% FBS. The cells were cultured at 37.5℃ in a 5% CO2 atmosphere and the medium was refreshed every 24 h.
The fibroblasts in logarithmic phase were treated with reversine (5 μM, Sigma-Aldrich Chemical Co.), dissolved in dimethylsulfoxide (DMSO), for 4 days and washed in DMEM. This concentration (5 μM) appeared to be optimal in the range studied. Control cultures were maintained in the same volume of DMSO without reversine. Cell morphology and proliferation were evaluated with phasecontrast microscope and counted on a hemocytometer. To induce osteogenic transdifferentiation, reversine-treated fibroblasts were cultured in low glucose-DMEM (L-DMEM) supplemented with 10% FBS, 50 mg/mL ascorbic acid-2-phosphate, 1 mM dexamethasone and 10 mM β-glycerophosphate for 14-21 days, and osteogenesis was assessed by alizarin red staining. 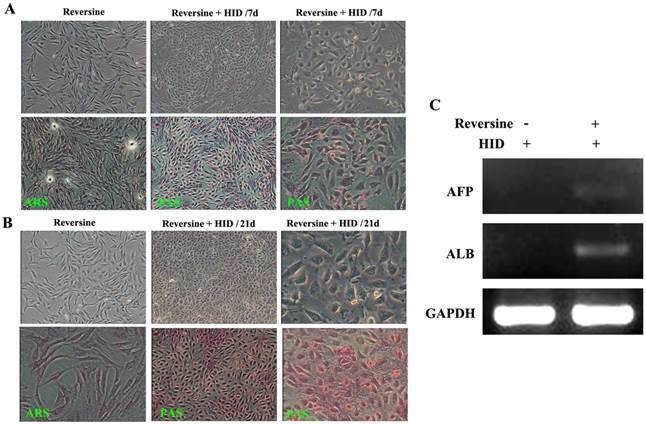 For adipogenic differentiation, the reversine treated-fibroblasts were cultured for 7 days in adipogenic medium supplemented with 1.7 mM insulin, 1 mM dexamethasone, and 0.5 mM 3-isobutyl-1-methylxanthinethe, adipogenesis was assessed by Oil red staining. For neuronal differentiation, after 2 days of incubation with 20 nM reversine, cells were then treated with 0.5 μM all-trans-retinoic acid (RA) in serum-free DMEM/F-12 medium supplemented with the ITS for 2 days and switched into serum-free medium in the absence of RA with replacement of the medium every 2-3 days. For myogenic differentiation, the reversine treated-fibroblasts were cultured in L-DMEM supplemented with 5% horse serum (HS) for 21 days. For hepatic differentiation, the reversine-treated fibroblasts were cultured in L-DMEM supplemented with 5% FBS, 20 ng/mL IGF-I, 20 ng/mL HGF and 10-7 M dexamethasone for 21 days, replacing the medium every 2-3 days. Periodic acid-Schiff (PAS) glucogen staining was carried out to evaluate hepatocyte transdifferentiation of the treated cells. For western blot analysis, the samples were separated by SDS-PAGE and then electroblotted to PVDF membranes (Millipore, USA), and immunoblotted overnight at 4°C with monoclonal rabbit anti-Aurora B (1:1,000, Santa Cruz, CA, USA), anti-Oct4 (1:200, Santa Cruz), anti-Sox2 and anti-Nanog (1:200, CST, USA) . The membrane was then incubated with anti-rabbit peroxidase-conjugated secondary antibody, visualized with the enhanced chemiluminescent method . The total RNAs were extracted with Trizol reagent (Invitrogen, Carlsbad, CA, USA) from control or treated fibroblasts. The reverse transcription PCR and relative quantitative real-time PCR were described previously , and the primers used in PCR reaction see Table 1. Cells were fixed with 4% paraformaldehyde, followed by permeabilization with 0.1% Triton X-100 for 10min, and blocked with 3% bovine serum albumin (BSA). The following primary antibodies were used to incubate with the cells for 2 h, the neuronal markers: anti-NFM, anti-MAP2, anti-TUJ-1 (1:200, Abcam, England), anti-NSE and anti-GFAP(1:200, Neuromics, MN, USA); cell surface and cytoskeleton marker: anti-α-tubulin, anti-CD44, CD29 (1:100, Abcam) and CD73 (1:100, Santa Cruz); the epigenetic markers: anti-histone acH3K9(1:200, Santa Cruz), anti-histone meH3K9(1:200, Abcam), the pluripotent marker anti-Oct4, anti-Sox2 and anti-Nanog, and the catalog numbers for all primary antibodies see Table S1 . After that, the cells were incubated with fluorescein isothiocyanate-conjugated (FITC) secondary antibody (1:100, Santa Cruz) for 1 h. For the nuclei staining, the cells were counterstained with 10 μg/mL of propidium iodide (PI) for 10 min. The results of immunofluorescence were observed under confocal microscopy (Nikon TE-2000-E, Tokyo, Japan). The cell cycle distributions of the DMSO and reversine-treated cells stained with PI were carried out by flow cytometry (Cytomics FC 500, Beckman Coulter, USA). Effect of reversine on cell surface marker expression and histone methylatin and acetylation was detected following by colabelling with CD44, CD29, CD73, acH3K9 and meH3K9 using flow cytometry, respectively. After 4 days of 5 μM reversine treatment, fibroblasts acquired a drastically different morphology, transformed from spindle shape into considerably larger in size, flatter, and more adhesive to the culture plate (Fig. 1A). And, the treated cells were hypertrophic and epithelial like morphology, and displayed a marked alteration of actin organization using phalloidin labeling staining (Fig. 1D). Although cell proliferation was completely inhibited in the presence of reversine(Fig. S1 B), no significant cell apoptosis and cell death were observed, showing reversine treatment did not cause irreversible damage to cells (Fig. S1C). Moreover, cell cycle analysis indicated reversine promoted the formation of tetraploid cell population, which reached about 81% at the end of the treatment (Fig. 1C, Fig. S1A), as previously observed in murine dermal cells . Chromosome karyotype analysis verified reversine-treated cells shifted from diploid/mononuclear (2n=60) to tetraploid/binuclear (4n=120), consistent with the results of the cell cycle analysis and immunodetection for BrdU incorporation (Fig. 1B, Fig. S1D). It's worth mentioning that the reverseine treated fibroblasts were able to reentry into the cell cycle after reversine withdrawn (Figure S2). Reversine inhibited spindle bipolarization and caused spindle monopolarization (Fig.1E). Microtubules also could not extend towards two poles after reversine treatment, and therefore the cells did not divide normally, which eventually led to binuclear cells. Western blot analysis revealed a marked reduction of Aurora B expression with the dose increase of reversine (Fig.1F). Moreover, after treated with 5 μM reversine for 4 days, the cells could not be detected Aurora B expression anymore, which confirmed that Aurora kinases might be the targets of reversine in vivo. 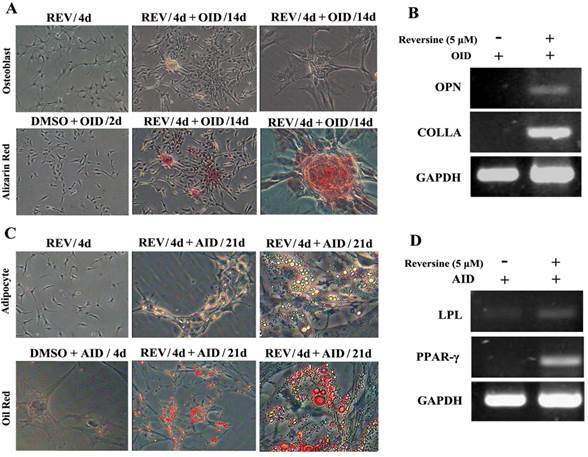 Reversine-treated fibroblasts could redifferentiate into mesodermal lineage, osteoblasts and adipocytes, under respectively specific differentiation conditions (Fig. 2). The pre-treatment with 5 μM reversine for 4 days led to striking differences comparing with the control cells when cultured under osteoblast-inducing (OID) conditions or adipocyte-inducing (AID) conditions. The positive staining for alizarin red (Fig. 2A) confirmed the presence of calcium deposits after OID, and increased mRNA expression of multiple osteogenic markers, including osteoponin (OPN), and collagen type-I (COLI) (Fig. 2B). In parallel, lipid droplets in reversine-pretreated differentiated adipocytes were located by Oil red O staining (Fig. 2C), and expressed multiple adipogenic markers, including lipoprotein lipase (LPL) and peroxisome proliferator-activated receptor γ (PPARγ) (Fig. 2D). Reversine alterd morphology, cell cycle and formation of polyploidy of fibroblasts. (A) Morphology of fibroblasts became large and flat with 5 μm reversine for 4 days; (B) Reversine treatment led to the accumulation of tetraploid cells (4n=120), comparing with normal chromosome of cattle (2n=60); (C) Cell cycle analysis of reversine-treated cells and control cells using flow cytometry; (D) Cells were stained with phalloidin (red), and counterstained with DAPI (blue), scale bar=50μm; (E) Expression of α-tubulin (Green) was analysis by immunochemistry and counterstained with PI (red), scale bar=50μm; (F) Western blotting analysis showed the expression of Aurora B gradually decreases with the increase of reversine concentration (100nm-5μm) for 4days. DMSO was used as a negative control in all experiments. Reversine increased the cellular plasticity of fibroblasts. A: Fibroblast were treated with 5 μM reversine for 4 days and then further cultured for 14 days in OID after removal of reversine (40×, 100×); Calcium deposits were appeared, and osteogenic differentiation was positive for alizarin red staining. B: Expression level of bone-specific gene osteopontin (OPN) and collagen (Colla) were analyzed by RT-PCR; (C) Fibroblast were treated with 5 μM reversine for 4 days and then further cultured for 21 days in AID after removal of reversine (40×, 100×); Lipid droplets were appeared, adipogenic differentiation was positive for oil red staining; (D) Expression level of adipogenic cells marker PPAR-γ and LPL were analyzed by RT-PCR and at least three independent cultures were performed. Reversine-induced fibroblasts acquired the differentiation potential for neural lineage, under neural-inducing (NID) condition (Fig. 3A). The expression of neural lineage specific markers was tested by immunofluorescence, and MAP2, NFM, NSE, GFAP and TUJ-1 were all positive after NID induction (Fig. 3B). Furthermore, expression of neural markers was also confirmed by RT-PCR (Fig. 3C), and the result demonstrated the differentiation potential of the reversine-treated cells to neuron. The conversion frequencies of fibroblasts to the neural cell were between 39.2±4.65 (NFM) and 53.2±6.60 (MAP2) (Fig. S3). The morphological changes of the reversine-induced fibroblasts at hepatic differentiation were shown at two different time points (7 days and 21 days). Under hepatogenic-inducing (HID) conditions, a heterogeneous population of epithelial cells and other cell types was simultaneously obtained in culture from the 7th day, and the ability of glycogen storage was not significantly visible (Fig. 4A). However, after cultured for another 14 days, most cells exhibited mature cuboidal morphology with granulated structures and glycogen uptake (Fig. 4B). RT-PCR results also showed that the reversine treated cells after HID induction could transcribe hepatogenic marker gene ALB but not AFP (Fig. 4C). To further characterize the pluripotency of reversine-pretreated cells, expression of specific markers (Oct4, Sox2 and Nanog) of pluripotent cells were analyzed by using RT-PCR, western blotting and immunofluorescence. In addition, we also wanted to identify which gene induced the differential potency. The results indicated that reversine dramatically increased the expression of Oct4, but Sox2 and Nanog were not detected (Fig. 5, A and B), which indicated the activation of Oct4 plays a key role in acquisition of cell pluripotency. Interestingly, upon reversine removal after 8 days, reversine-treated fibroblasts gradually returned to original phenotype and the expression of Oct4 decreased to a very low level (Fig. 5C). Reversine-induced fibroblasts could differentiate into neural cell and myotube differentiated cells. A: The fibroblasts treated with 20nM reversine for 2days (left), and then further cultured for 4 days in NID (right, 200×); B: Expressions of MAP2, NSE, NFM, GFAP and TUJ-1 were analyzed by immunocytochemistry (100×); C. Expression level of neural stem cells marker gene (Nestin), neuronal marker genes (MAP2, NFM, NSE), and glial marker genes (GFAP and MBP) were analyzed by RT-PCR. 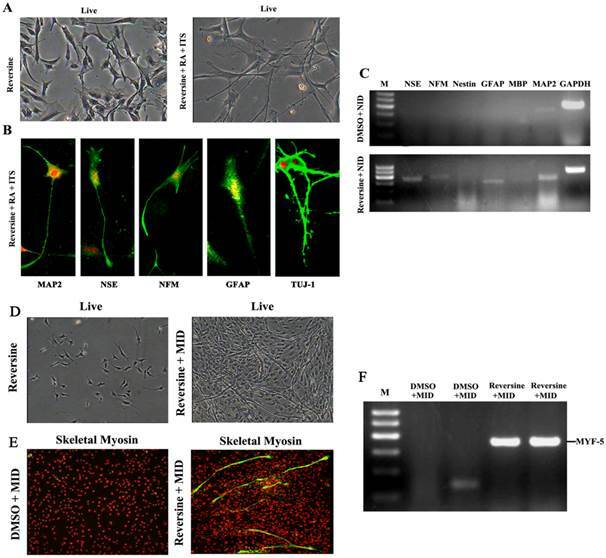 D: Reversine -treated fibroblast and then further cultured in MID for 21days (40×); E: The reversine and MID inducing cells were positive for fast skeletal myosin staining (100×); (F) Expression of myotube cells marker gene MYF-5 was analyzed by RT-PCR. Morphological features of the hepatogenic differentiated cells. A: The reversine-treated fibroblasts before induction and the control cell were negative for alizarin red staining (40×). Periodic acid-Schiff staining assay in hepatogenic differentiated cells cultured in HID for first 7 days (40×, 200×). B: The differentiated cells on day 21, cells exhibited a polygonal shape with cytoplasmic granules. Glycogen uptake was shown after 21 days upon treatment with HID (40×, 200×); C: Expression of hepatogenic cells marker genes AFB and ALB were analyzed by RT-PCR. Intensities of Oct4, Nanog and Sox2 signals in reversine-treated and control cells for the increase of multipotency. A: Expression of pluripotent markers Oct4 Nanog and Sox2 was analyzed by immunocytochemistry; B: Expression of pluripotent marker genes (Nanog, Sox2, Oct4) was analyzed by RT-PCR and Western blotting; C: Reversine-treated for 4 days (+), and then reversine removed, the expression of Oct4 decreased to a very low level after 8 days, normalized to GAPDH levels. Histone modifications such as acetylation and methylation play an important role in regulation of gene expression through altering chromatin structure . Reversine treatment caused a significant increase of the level of histone acH3K9 (Fig. 6A), which was further confirmed by the quantitive analysis using flow cytometry (76.34%±3.84 increased, Fig. 6C). In contrast, meH3K9 as the marker of histone methylatin was obviously decreased 43.23%±5.34 (Fig.6, B and C). Taken together, the results indicated that the reversine induced dedifferentiation of fibroblasts into multipotent progenitor-type cells might be attributed to the activation of histone acetylation, and the degression of histone methylation. As shown in Fig. 7A, stronger fluorimetric signals were obviously observed in the reversine-treated cells, and a higher percentage of treated fibroblasts expressed CD44 (control: 9.85%±0.21%; reversine treated: 89.09%±1.28%), CD29 (control: 49.56%±1.28%; reversine treated: 79.85%±0.21%), and CD73 (control: 41.35%±1.42%; reversine treated: 43.53%±2.45%). And, the mRNA expression levels of CD44 and CD29 appeared a significantly increased after the reversine-treatment by RT-PCR, which was consistent with the results above (Fig. 7, B and C). These results indicated that the fibroblasts can be dedifferentiated into a mesenchymal stem cell-like style by reversine treatment. Ding and Schultz firstly identified a small molecule-reversine, which induces dedifferentiation of C2C12 cells into multipotent progenitor cells . Then, it has been evidenced that reversine-treated myoblasts and dermal fibroblasts can be induced to transdifferentiate into osteoblasts, adipocytes and muscle cells both in vitro and in vivo [10, 15, 17]. In our conditions, reversine enhanced not only mesoblastic differentiation, such as osteoblasts, adipocytes, and myoblasts, but also the neural ectoderm and endoderm, which indicated that reversine reprogrammed fibroblasts to a state of increased plasticity and promoted differentiation at high frequency. Moreover, this is the first study to evaluate the dedifferentiation potency of the long-term cryopreserved fibroblasts, which confers further support to potential therapeutic application. The changes of the level of histone methylatin and acetylation. 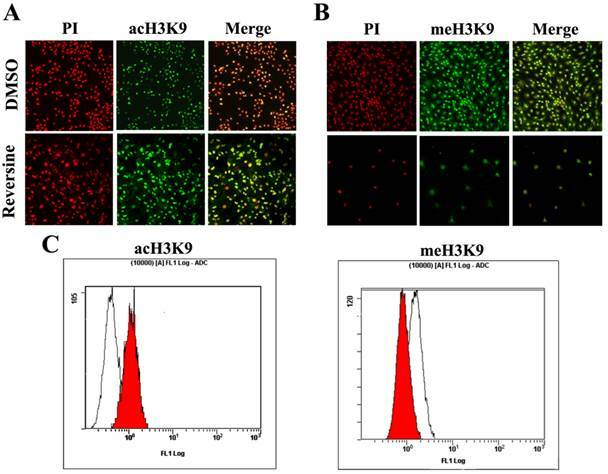 A, B: Intensities of acH3K9 and meH3K9 signals in reversine-treated cells and non-treated ones were analyzed by immunocytochemistry. Fibroblasts were treated with reversine for 4 days, PI, Red; anti-acH3K9 and anti-meH3K9 immunofluorescent, Green; C, D: Cells were stained with acH3K9 and meH3K9 analyzed by flow cytometry. 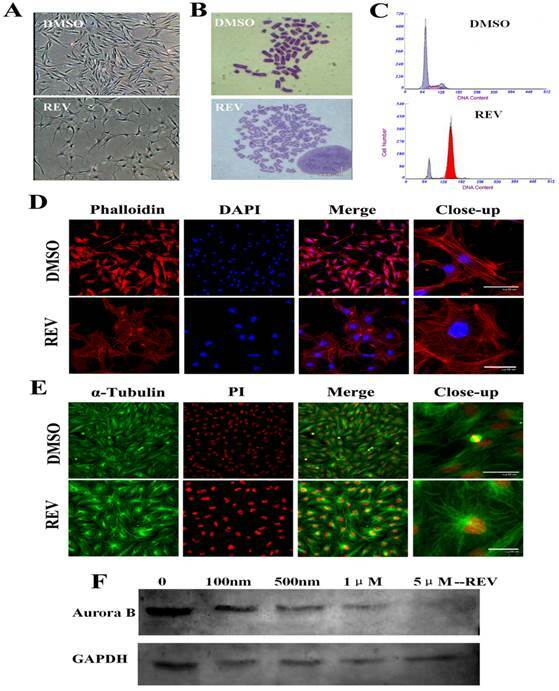 Reversine enhanced generation of mesenchyme-like cells by dedifferentiation of reversine-treated fibroblasts. A: Effect of reversine on cell surface marker expression treated with 5 μM reversine for 4 days. The expression of mesenchymal stem cell markers CD44, CD29 and CD73 were analyzed by Immunofluorescence (100×), Green; PI, Red; B: Cells were colabeled with CD44, CD29 and CD73 and analyzed by flow cytometry; C: RT-PCR and qRT-PCR were used to examine mRNA expression levels of CD44, CD29 and CD73. Fibroblasts were treated with DMSO as control. It is now generally accepted that growth arrest is a prerequisite of cell differentiation in many biological systems . Polyploidy is a normal developmental process that occurs in several cellular systems including plants, insects, and mammals. The researchers added reversine to myoblast cells that differentiated into multinucleated myotubes, and induced G2/M phase arrest at resulting in the formation of polyploid cells. This phenomenon was confirmed in variety of cancer cells, such as thyroid cancer cell, oral squamous cell carcinoma, and breast cancer cell [19-21]. The current study demonstrated that reversine treatment accelerated the cell cycle without completing abscission and therefore led to the accumulation of tetraploid cells. These results suggest that the effects of reversine on cell cycle may contribute to the increase in cellular plasticity. Generally, acetylation of H3 and H4 in the regulatory regions of genes is associated with gene expression by regulating chromatin structure and function. Recent progress in epigenetics has also highlighted the importance of histone lysine methylations, especially the methylation of H3-Lys-9 and H3-Lys-27 directs gene silencing [4, 22]. Indeed, just as the results showed, the fibroblasts after reversine treatment increased the level of H3K9 acetylation, and decreased the level of methylation of histone 3 lysine 9 (H3-Lys-9) and H3-Lys-27 (Fig. 7). Moreover, reversine was also confirmed to be a potent Aurora B kinase inhibitor and inhibit histone H3 phosphorylation that resulted in chromatin remodeling . Besides cell proliferation and cell cycle, reversine also had a dramatic effect on fibroblasts cell morphology conversion. Active remodeling of the cytoskeleton and actin filaments dynamics are essential to most biological processes involved in cell motility and morphological changes, including cell migration, spreading, division and cell fusion. In our study, the flattened, epithelial like morphology was acquired after reversine treatment and the hypertrophic fibroblasts displayed a marked alteration in phalloidin staining, suggesting actin organization was altered. Meanwhile, reversine inhibited spindle bipolarization and caused spindle monopolarization. In summary, the accumulation of 4N cells is not due to a premitotic arrest but is the result of the inhibition of cytokinesis by reversine. Moreover, it is also found that an increment of tubulin promoted the assembly and organization of the cytoskeleton. 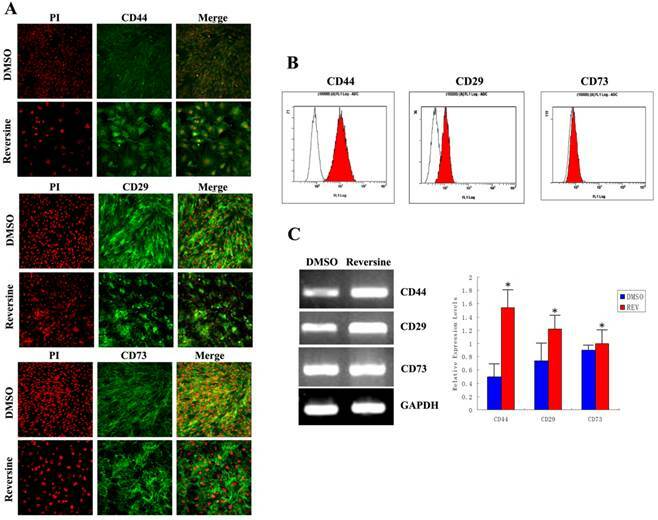 Treatment with low concentrations of reversine promoted dedifferentiation of the fibroblasts, marked decrease in proliferative potential and distinct cell swelling. Nevertheless, Kim et al reported that reversine treatment had little effect on 3T3-L1 cell morphology and sporadic lipid accumulation under standard adipogenic condition . In contrast, most of reversine pre-treated fibroblasts in our study differentiated into adipocytes with significant accumulation of lipid droplets. This difference about lipid accumulation might be attributed to the different response to reversine of different cell types. Additionally, these cells were capable of being differentiated into cell types expressing differentiated markers of Myf5 (endoderm) and OPN, LPL (mesoderm) and MAP2, NSE, NFM, GFAP, TUJ1(ectoderm). Moreover, we demonstrated that reversine treatment resulted in the expression of MSC marker genes, such as CD29, CD44 and CD73. Importantly, this study has extended earlier studies by delineating that there is a significant increase in expression of pluripotent marker Oct4 of ESCs and iPSc after reversine treatment. Oct4 expression was disappeared at the 8th day after reversine removal, supporting a possible reversine-induced change in lineage commitment. At the first 6 days after reversine removal, the fibroblasts held multipotential characteristics, and the mesochymal genes were up-regualated. Although the expression of Oct4 is reduced with the culture time extended, the cells had got sufficient differentiation potential. Moreover, Oct4 signaling is shown to be essential in reversine's activity. However, Sox2 and Nanog were not detected, which indicated Oct4 plays a key role in acquisition of cell multipotential. In summary, these data clearly suggested that reversine possess a dual activity as it promotes the plasticity of long-term cryopreserved fibroblasts and dedifferentiate into stem-cell-like progenitors, through up-regulation of multipotential marker genes, but it also induces cell growth arrest and ultimately accumulation of tetraploid cells. However, the detailed molecular mechanism how reversine regulated cellular plasticity and induced multipotent progenitor cells remains to be determined. This research was supported by the Agricultural Science and Technology Innovation Program (ASTIP- IAS01), the project National Infrastructure of Animal Germplasm Resources (2014 year), the National Scientific Foundation of China (81301333), and the Natural Science Foundation of Anhui Province (1408085QH155). Corresponding authors: W.J. Guan, Institute of Animal Science, Chinese Academy of Agricultural Sciences, Beijing 100193, China; Tel: +86-10-62815992; Fax: +86-10-62895371; E-mail: wjguan86net.cn; W.H. Ma, Yuehui.manet; C.Q. Liu, Department of Bioscience, Department of laboratory medicine, Bengbu Medical College, Bengbu 233000, China, E-mail: lcq7813com.